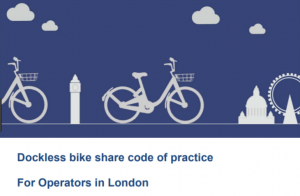 This code of practice has been developed by TfL in collaboration with London’s boroughs and other key stakeholders for potential operators of dockless cycle hire schemes. Dockless cycle hire is a service in which bikes can be located, hired and unlocked using a smartphone app and do not require a docking station. The code lets operators know what is expected of them and ensures that dockless bike schemes complement London’s public transport network and support the Mayor’s Transport Strategy.